My hiatus from blogging is over. You can all breath again. Ha ha. I didn't intend to not blog for this long, but I was on a family vacation to Orlando. Didn't have a WiFi connection where I was staying, so hence the absence. We visited Universal Studios on Friday and Saturday. 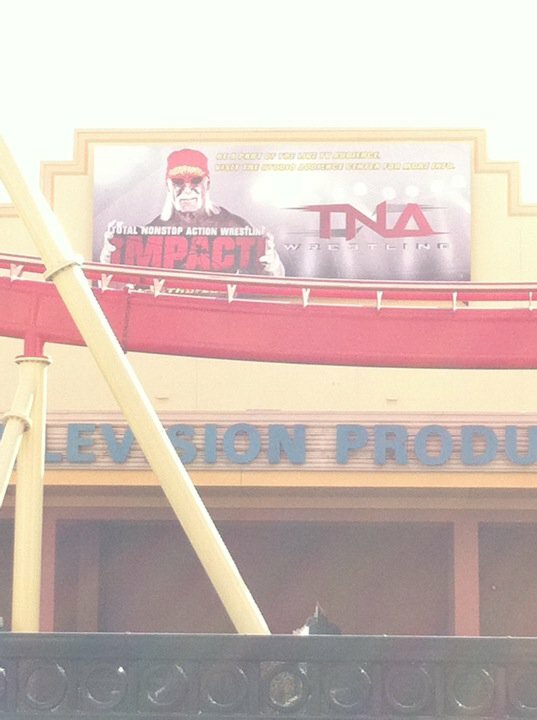 Universal of course is the home of TNA Wrestling and the Impact Zone. But other than that sign you see at the top of the page, and the TNA Taping on the calendar they have available at the front park, you wouldn't know there was such a thing as TNA at Universal. This struck me as odd, as we went into several of the gift shops inside the park and along the City Walk area leading to Universal Studios and Islands of Adventure. I didn't find one piece of TNA related merchandise. No shirts, no hats, no action figures. Nothing. The only wrestling related items I saw at either park besides that sign, was a handful of John Cena t-shirts being worn by visitors. Maybe there is a legit reason for this. But I can't imagine what that would be. Every other attraction and feature in the park has memorabilia and paraphernalia in the stores. There are kiosks and stands everywhere selling Simpsons stuff, Harry Potter stuff, Marvel Superheroes stuff. You get the point. I can only imagine if Vince McMahon had the opportunity to tape a weekly show inside a theme park with a captive audience and lots of spending money. I could see tshirts, hats, action figures, bobble heads, breakfast cereals, books, DVDs, posters, etc. being hacked around the park. I was also disappointed "the Zone" was closed. I'm not sure what else that building is used for, but if they only tape TNA shows in there, why not open it up and let the fans take a look inside. Maybe on select days have some of the guys and gals there signing autographs, walking around the park, and meeting the fans. Just a suggestion. Like I said, maybe there are all valid reasons as to why this isn't happening, but to me it's a basic marketing 101 concept and is part of the reason why TNA still struggles to gain that global popularity that the WWE has had for so long.